In many areas, there may be two or more people sharing a central location for mail delivery and commercial mailboxes are available to meet a variety of needs. Multi-unit neighborhoods often have mail delivered to only one location and commercial mailboxes can be designed to hold mail for dozens of people. Mail is usually delivered through the back of commercial mailboxes with each postal patron having a key to their own mailbox. These commercial mailboxes can often be seen in strip malls and mobile housing neighborhoods where the postal carrier does not have the time to stop at each business. Instead, all mail is deposited into a central commercial mailbox and each business makes a daily trip to pick up their mail. With this type of service, security is important to the mail recipients as well as the U.S. Postal Service and all commercial mailboxes have to meet the specifications of the USPS. One of the challenges of commercial mailboxes is the potential delivery of large packages to some businesses. The multi-unit boxes can be designed to include areas for parcel deliveries, whether available for all residents or only for a few. Parcel lockers, whether wall or pedestal mounted, offer ease of delivery and security. Typically, the delivery person places the package in the locker and a key in the recipient’s mailbox. Once the key is used to open the locker, it can only be removed by using a second key that remains with the delivery service. Additionally, outgoing mail is not usually placed in the individual commercial mailbox. Most have a single secure box in which outgoing mail is deposited for pickup. When the postal carrier makes a delivery they take the outgoing mail at the same time. Larger package drops are also available for community mail services to accommodate outgoing packages. There are numerous designs available for cluster boxes that can add to their appearance and better fit into the surrounding area. 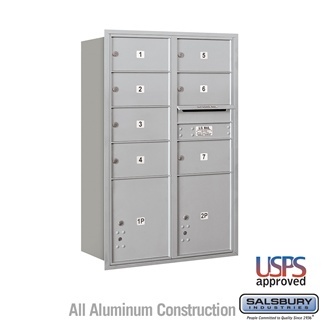 Regardless of design, commercial mailboxes have stringent requirements established by the U.S Postal Service to insure the safety and security of outgoing and incoming mail. They also have to be manufactured to protect the mail from damage by the elements.